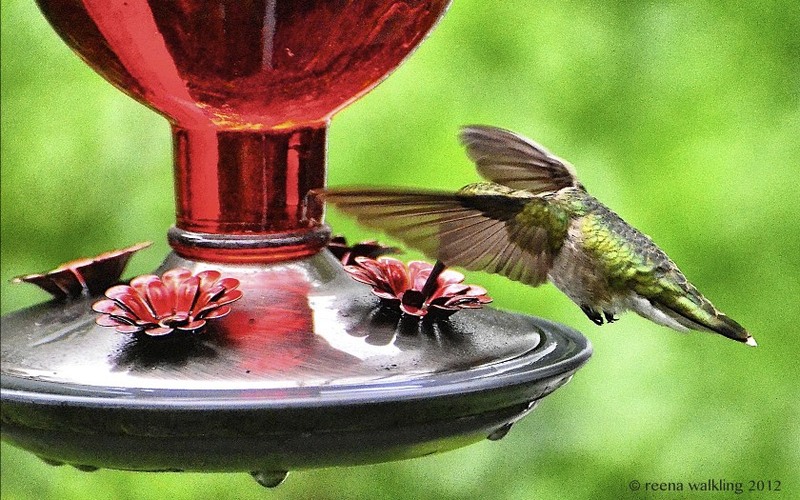 the hummingbirds were only showing up once or twice a day. And most times it was just the little girl. the boy has been showing up. Maybe they are a couple! I'm just glad they are coming around a lot more. So far today, they've been feeding like every 15 minutes! It's been sort of a bird frenzy in the back yard today. all battling over the feeders. But back to the hummingbirds. 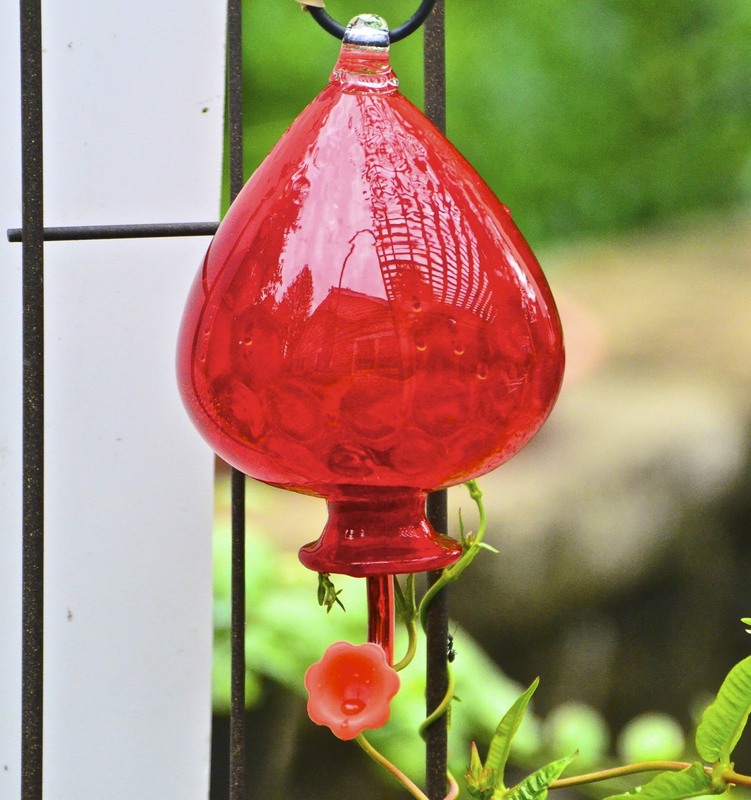 I bought this feeder over the weekend thinking it rather attractive and thought my hummingbirds would think so too. even being near the other 2 feeders. the ants sure have been checking it out. I've got to redirect a bunch of black ants! i think we only have 2 hummingbird couples here this summer. Great shots of the hummies. They are so beautiful!!! the photos look like beautiful stained glass. Lucky!!!! I've only seen ONE, a female at that. If I saw a ruby throat I'd have to put my camera on a tripod because I'd be shaking with excitement. lol Love the images you captured of these fascinating birds. I "LOVE" these!!! I posted hummingbirds today, too. I do love your hummingbirds! They're so beautiful -- and they're obviously pretty picky if they don't like that lovely new feeder!! Lovely, lovely captures as always, Reena! Hope your week is going well! I wonder what it is about the new feeder they don't like. Gotta be something. Maybe the holes aren't right for their bills. Oh, that feeder. I didn't get the same one. The one I bought was tiny. But Reena - your hummer photos! Do I sound like a surfer dude? Or maybe I've been listening to too many high school kids here at school . . .
What wonderful photos!!! I love the new feeder and thought I should look for one like it. Surely it is screaming GET YOUR NECTAR HERE. I cannot imagine why they are not using it, except maybe they are sticking with what they already like. they are about the prettiest of birds they are! love your shots, every single one. Lovely captures. We're enjoying the hummingbirds around here, also. A very exotic bird for us here in Norway! Wonderful shots of this beautiful bird! That's a beautiful new feeder. It's a shame they haven't discovered it yet, but I have a feeling they will eventually. We have a huge trumpet vine that goes way up a tree. It's fun watching the hummers up there. 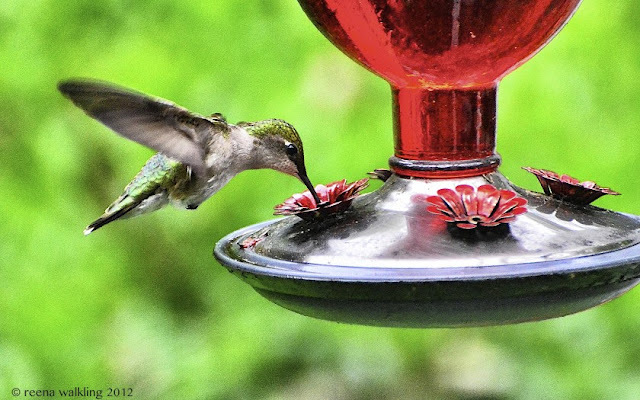 Beautiful photos of the Hummingbirds. We don't have anything like that out here in Australia. It must be great to watch and photograph them. A lot of my birds seem to have disappeared, :0( Hope they come back soon. Guess grubs and wormies are more interesting than my birdseed and suet. They are so pretty, these little fellows! Lovely pictures -- your yard is alive with birds, wow! Funny how hummers are so particular about which feeders. Oh Reena..these are just stunning! I wish I could photograph mine but since I can't, I'm thankful that you share your beautiful shots! Oh the money we spend on fancy feeders and when it comes right down to it, they don't care on bit. Great shots. I'm totally envious of the view you have of your birds....and after seeing a photo of your back "patio" on Daryl's blog, I'm totally envious of that, as well. 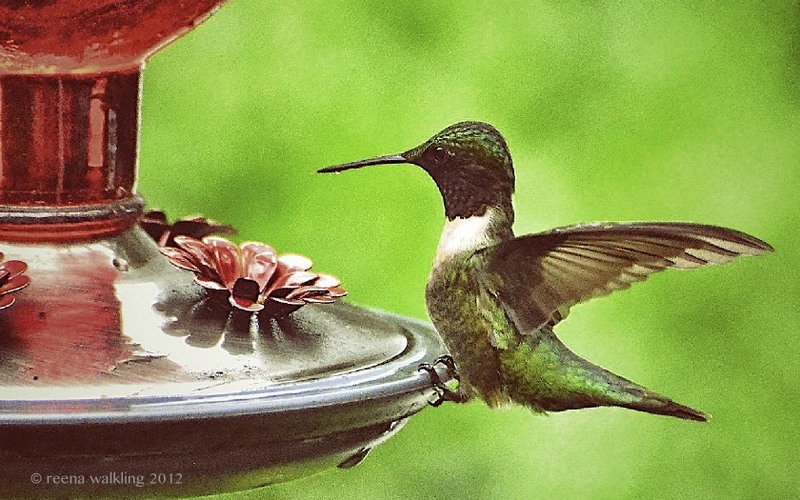 ;-) LOVELY images of the hummers. Gorgeous captures of the hummingbirds. They are just the cutest birds. Thanks for sharing, have a great week ahead. Nice shots and photo work! It looks like these hummingbirds are fond of your "red wine". First off...great shots!!! Second, I had to laugh....we humans love the fancy hummer stations....I'd hang them up and no one would visit....then I purchase a regular hum drum one....and they came in the droves! 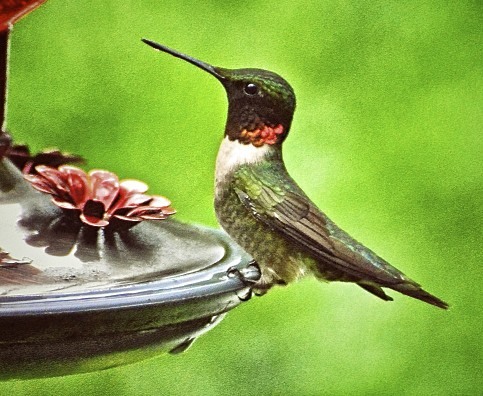 The answer is stick to the plain ol' feeder...they're cheaper:) I'm hoping to capture this particular hummer soon. I've heard a hummingbird whiz by my head a couple of times but not been able to it land anywhere yet. Your photos are so clear. They're absolutely gorgeous and fun to watch. WOW - you got some GREAT shots!!!! damn those hummers .. where the heck were they this weekend? slacking off I guess ... sigh ... I dont know why they dont love the new feeder, I do. Excellent shots. So crispy and colorful. Oh, so very gorgeous! I've never seen hummingbirds in real life. Such great photos. Oh yes the Ant here love our feeder. I had to be strategic on where to put the feeders so the ants couldn't get it..
LOL Reena...your hummers are kin to mine. They do not like change. One year I put out a new feeder...and I declare Mr. come up to the dining room window flapping his wings and sticking his tongue out at me. I put the old one back pronto. Mine seem to be mia right now. Hmph! Beautiful shots Reena! The clarity is wonderful. I managed some flight shots for my post for WBW this week but not like this... yours are great. Reena, WOW!!! love those hummingbird shots!! !I think that new feeder is indeed attractive.Enjoy your weekend! Excellent shots, Reena! I always miss out on hummers, but you are good at it! Takes skill and patience.